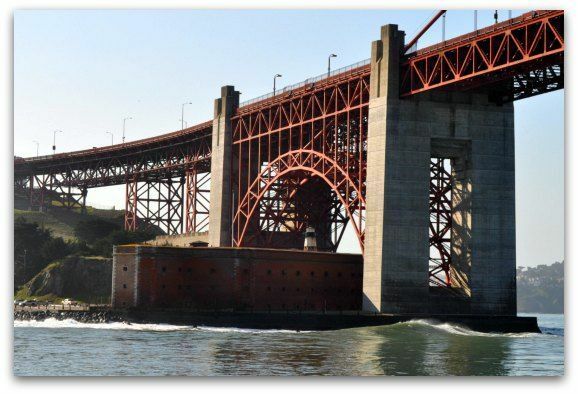 Fort Point National Historic Site is a fun place to visit for those interested in the rich military history of San Francisco. This historic gem is just below the southern end of the Golden Gate Bridge in the Presidio. It is just one of the free SF attractions. Fort Point is the brick building just underneath the Golden Gate Bridge. A visit to this old army building offers you the chance to learn more about its history with memorabilia and films. During your visit, you also get the chance to learn more about this building's place in the history of San Francisco. I have had the chance to visit many times. 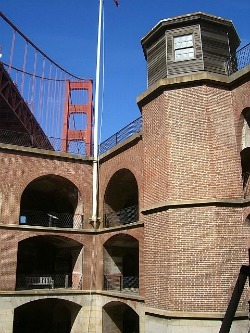 It's fun to walk around the courtyard and climbing the stairs to the top for gorgeous views of the Golden Gate Bridge. 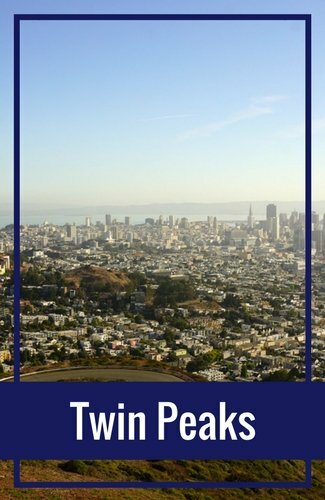 If you like history, this is a one of the San Francisco tourist attractions you will really enjoy! Fort Point was built in 1861 by the US Army. They built it as a way for the Army to protect the San Francisco bay from unwanted visitors and anyone looking to attack. This building was used as a fort only until 1900. As weapons became more powerful, the army thought its structure was too weak. They feared it would be destroyed under any sort of major attack. After this, the army mainly used this building as a barracks. Some people called this place home for many years. In the early 1930s, the building was almost destroyed. Engineers determined it needed to be demolish to make way for the Golden Gate Bridge. After a review of the structure itself, it was deemed a high value historical site and should remain standing. The Golden Gate Bridge engineers went back to their plans and figured out a way to build around it. The architecture of the building is unique, which is why there was so much interest in preserving it over the years. Finally in the fall of 1970, it became a national historical site. Today, the building stands tall under the monstrous Golden Gate Bridge. The parking lot is a great place to see how the engineers worked the bridge around this amazing building. Again, it's free to step in and look around. You enter through an archway that leads to the main courtyard. In the courtyard, you will find some old cannons that were installed when the fort was originally built. You are free to wonder around the Fort Point National Historic Site on your own. Free guided tours are also available. They start near the entrance of the building. The fort is about four stories high with a great open area on the top floor. You can walk in and out of the rooms on all of the floors. Many have historical items that were used at the fort by the military while it was open. The top floor is also a great place to get amazing photos of a variety of San Francisco attractions. 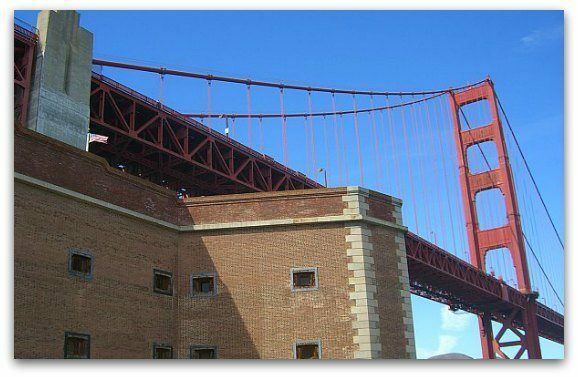 Since the fort is right under the Golden Gate Bridge, you can get great close up photos of the bridge. You can also see Alcatraz Island, downtown San Francisco and more from the top floor of the building. Before you leave, make sure to step in and watch the free historical movie about the fort. It's a short, 20 or so minute film that gives you detailed information on this amazing structure. There is a second video in the same room that gives a historical account of the construction of the Golden Gate Bridge. Each of the movies play a couple of times a day. The schedule for the movies is in the arch when you first enter, so you can plan your trip around the different activities at the fort that day. 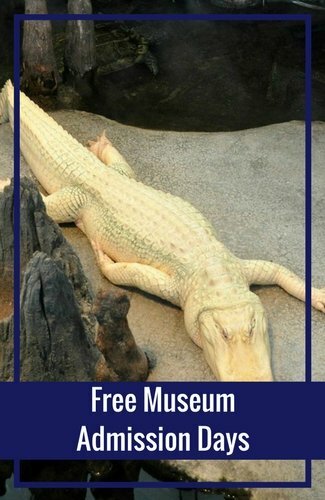 This is a great, free attraction to add to your itinerary when other popular sites are a little more crowded. You should also visit at a time when it's not too rainy. The interior is an open courtyard so your visit is mostly outside. If it is rainy, then make sure you to bring your rain gear inside for your visit. When is Fort Point National Historical Site Open? 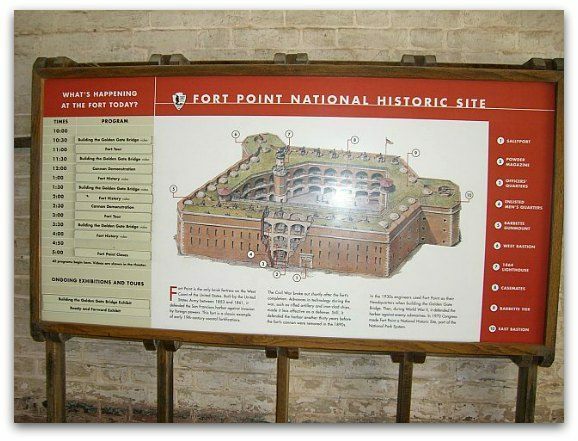 The Fort Point National Historic Site is open Friday through Sunday from 10am to 5pm. The site is closed on Thanksgiving, Christmas and NY Day. The last time we visited the Fort Point National Historic Site, we stayed to watch the cannon demonstration. One of the rangers on duty showed us how the military set up, loaded and fired these huge cannons. The fun part about this demonstration is the audience participation. When we visited, about five people from the audience each took a role to demonstrate the entire process. 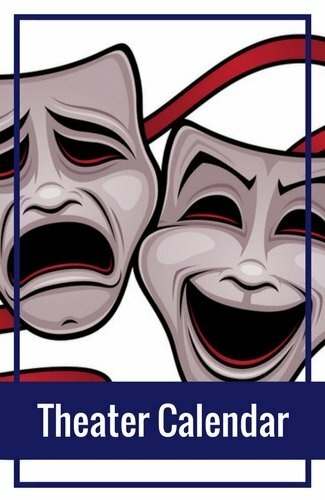 This demonstration is located on the main level of the fort and I recommend participating since it was a lot of fun. The Fort Point National Historic Site also has a few fun events during the year. Their Candlelight Tour is the most popular. It is conducted at night, in the dark. It will give you a feel for what it was like to live in the fort, especially at night. It's a really cool experience and is fun for anyone that enjoys history. 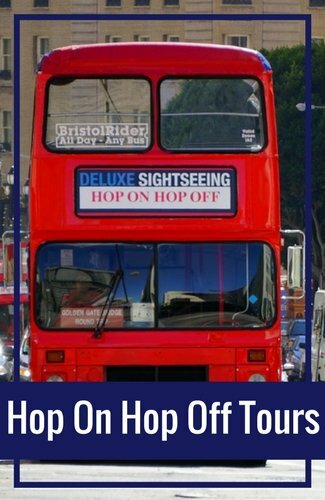 This tour is only on Saturday nights, during the months of November through February. 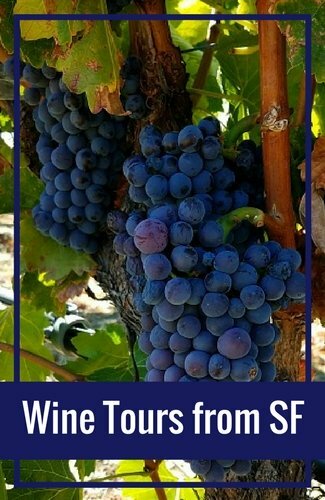 It is by reservation only -- contact them at 415.556.1693 to book your spot. It fills up quickly, so make your reservation as soon as possible. There are a few options to get to the fort for your visit. Unlike many other San Francisco sites, this one has parking right out front. If you are driving from San Francisco, take 101 North and exit right before at the Golden Gate Bridge Toll Plaza. Do not get on the bridge, you want to exit right before. Turn right at the end of the exit ramp. Then turn left onto Lincoln Boulevard in the Presidio. Take the first left onto Long Avenue and then Marina Drive. Fort Point is at the end of this road. After you take the exit, you should also see signs that will help you find the fort. The other option is to bike or walk down from Crissy Field. There is a beautiful walking and biking path along the water. It's about a mile from the Crissy Field parking lot. It's a gorgeous walk and a great way to take some pictures of the Golden Gate Bridge as you walk along the water. I highly recommend a visit to the Fort Point National Historic Site for those that love history. It's a quick and easy visit. 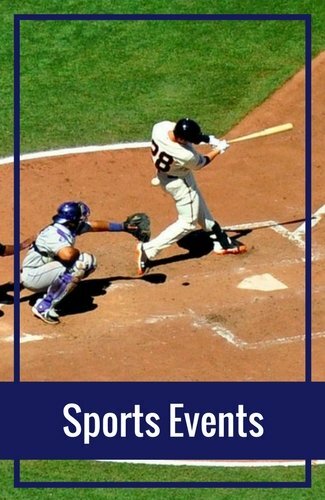 It's also free and is such a huge piece of San Francisco history. 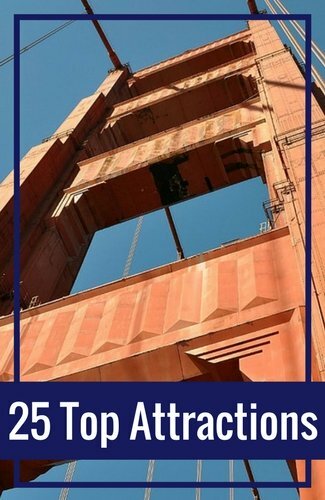 Alcatraz History & Visiting Tips: Want to learn more about the history of San Francisco? Read on to discover the facts on the infamous Alcatraz Island -- and the prisoners that called it home. Golden Gate Bridge: The Golden Gate Bridge is another popular San Francisco attraction. When did it open? Why was it build? How many cars cross it each day? Find the answer to these and more of your questions on this beautiful landmark. Haight and Ashbury District: Another place that bursts with history is the Haight Ashbury district. It was the home of the 'Summer of Love' in 1967. Uncover the truth of this small, but very colorful San Francisco neighborhood.